I did a lot of talking about fan behavior last week. First in my column for the Philly Post. Then on WIP Thursday night with Spike Eskin. Then Friday on the podcast. And there was one thing I learned that I couldn’t put in the column but thought was really remarkable and thought you guys might dig. In the 1920s, the Philadelphia A’s had a solid outfielder named “Good Time” Bill Lamar (left). He was a solid hitter, batting .310 over his 4 seasons in Philadelphia. But the hecklers at Shibe Park would simply not let him off the hook. Fans like the Kessler Brothers and their cousins, the Ziegler Brothers, worked as food vendors during the mornings, then let off work to go to games in the afternoon. And, since they had paid for their tickets, they believed they had carte blanche to mentally destroy the home players. They were the 700 Level before the 700 Level existed. But what made it strange is that unlike the Vet, Shibe was a nice place for a ballgame, and unlike the Phillies, the A’s were usually pretty damn good. Mack was furious, at one fan in particular. His name was Harry Donnelly, and the 26-year old had ridden Lamar harder than anyone else at the park. Finally, after Lamar was granted his release, Mack decided to get his revenge. A month after Lamar’s exit, Donnelly started jockeying another A’s player. Mack had had enough. He had Donnelly arrested and taken out of the Park. After the game, Mack walked down the street to the police station and swore out a warrant against Donnelly for disturbing the peace. “This man’s rooting has damaged the morale of my team,” Mack told the magistrate. “He has been razzing us all year with a voice that carries like a three-mile loudspeaker. Because of him I have had to dispose of Bill Lamar, a competent outfielder. He has assailed other players until they are of little use to the club at home…He has done more to ruin the morale of the Athletics than any other factor, including the bats of Ruth and Gehrig.” The magistrate held Donnelly on $500 bail and threatened to fine him if he were again “handing out raspberries.” I have to assume that Donnelly learned to shut his fat mouth. There is no more historical record of him after his arrest. A lot of info for this piece came from Connie Mack: the Turbulent and Triumphant Years. 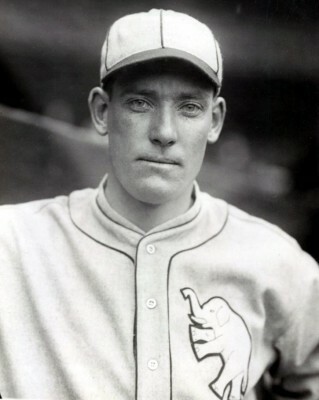 Photo of Bill Lamar comes from his SABR Bio.